Fundamentally, what was the development of Toyota’s production system about? Why was there a need for it? It was about employees in a small start-up company working to find ways to produce motor vehicles in low volume and at low cost. So what? Well, what that means is TPS was (and is) a lived human experience in destroying preconceptions* — breaking the status quo. Economies of scale curve (“Preconceptions”) compared to flow curve (“Preconceptions Destroyed”). Click on image to enlarge. 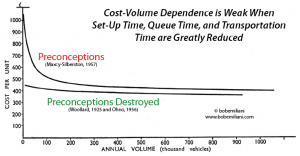 The age of mass production (dating to the late-18th to mid-19th century) introduced the widespread preconception that low costs can only be achieved by producing goods in high volumes. Ever since then, business leaders have religiously pursued economies of scale (labeled “Preconceptions”). It is one of their governing preconceptions. 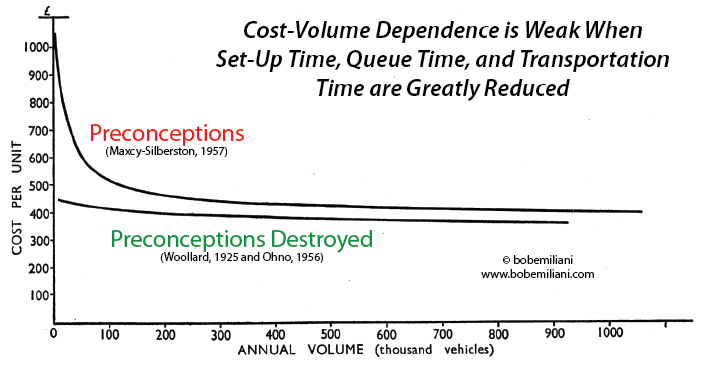 But as the image at right shows, the dependence of cost on volume weakens greatly when flow is achieved (labeled “Preconceptions Destroyed”). Flow destroys the preconception of economies of scale. But to achieve flow in everyday work, scores of other preconceptions have to be destroyed. These include Just-in-Time, jidoka, kaizen (how to improve rapidly by trial-and-error), heijunka, takt, pull (kanban), plant layout, batch size, right-sizing machines, simplifying tooling, standard work, multi-process handling, multi-skill development, SMED, etc. The whole of TPS, and Toyota’s management practice generally, is about destroying preconceptions. For decades, people have asked “Why is Toyota’s management system so hard to replicate?” Because preconceptions are so hard to destroy, and therefore the status quo is easy to maintain. Destroying preconceptions requires focused individual initiative and a special type of leader who allows people to break with the status quo. However, modern business descends from the militaristic medieval social system of feudalism. In it, people are forbidden or discouraged to ask “Why?” They must accept the status quo and associated preconceptions because they are regarded as faithful to vested interests. Despite feudalism being a long time in the past, some of its effects are still with us today. If an employee can accept “the system” as it is, then they are more likely to find meaning and satisfaction in life (which includes work). Those who cannot are tormented by a future state that they can easily see but cannot easily reach. To reach the future state requires teamwork. Yet, by my estimate, at least half of any corporate population is satisfied with the way things are — well enough to resist needed change, either overtly or covertly through passive-aggressive behaviors. Then, as we enter the realm of management, we find 95 percent or more who have little interest in destroying preconceptions and breaking the status quo. It as if there is a core (feudal) company within the larger (modern) corporation called “Status Quo, Inc.” that is incredibly efficient at providing a critically important fulfillment service to its customers (employees) — meaning and satisfaction in life. Now 30 years into the Lean movement, we have gained a broad perspective on change, and its seems to take on two principal forms: emulative and factual. Factual means change has actually occurred through the lived human process of destroying preconceptions and the experience of creating new physical realities. This is uncommon, requiring the daily work of trial-and-error and the continuous development of skills and know-how as times change. What appears to be far more common is emulation, which means people emulate others’ limited understanding and restricted practice of Lean thinking, Lean methods, and Lean tools, sufficient to create a convincing appearance of interest in change, but always securely within the boundaries of the status quo to assure no loss of meaning and satisfaction — which is more important than comprehensive changes in work methods. Emulation, however, may or may not be a conscious act. This static, limited understanding and practice of Lean reflects an acceptance of preconceptions and the status quo and shows the great power they both hold over the spread of Lean management. As the feudal leadership mindset continues into the 21st century, executives will make decisions about powerful emerging machine technologies (artificial intelligence, robotics, etc) that assure continuity with the past. Under these circumstances, the continuing failure to destroy preconceptions and break with the status quo may no longer deliver meaning and satisfaction in life as it once did. Perhaps, then, more people will start asking “Why?” In contrast, the Toyota leadership mindset will seek to keep the many and varied interests in a healthy, productive, and balanced relationship for the long-term. Toyota’s management system will be more easily replicated when organizations replace their core company, Status Quo, Inc. with a new core company called “Destroy Preconceptions, Inc.” You will find that it delivers orders of magnitude more meaning and satisfaction than Status Quo, Inc.
* Preconceptions, being based on faulty, vague, or incomplete information, are a type of cognitive bias, one that takes a form more like that of superstitions, which are either sympathetic to the status quo or hostile to change. Leaders’ superstitions easily become followers’ superstitions, which, in turn, retards needed progress.